How I Feel About Books: Happy Valentine's Day! Yesterday, several individuals from SRVS came to the library wearing red sweaters, ready to celebrate Valentine's Day! 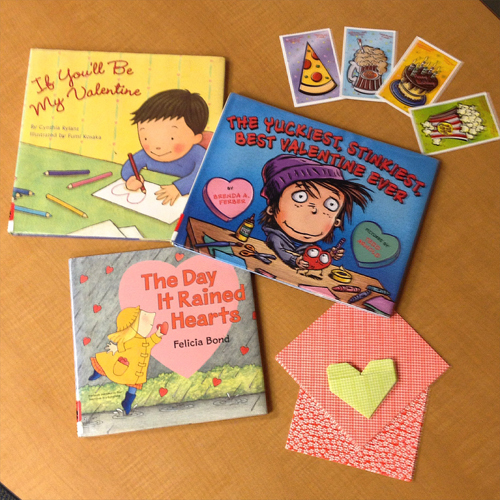 We read two books about making Valentines for special people in your life, The Day it Rained Hearts by Felicia Bond and If You'll Be My Valentine by Cynthia Rylant. The last book was much sillier - The Yuckiest, Stinkiest, Best Valentine Ever by Brenda A. Ferber. 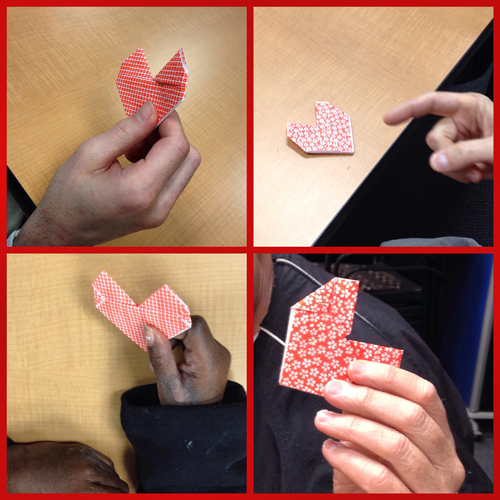 Then we made origami hearts. This was a great project because it required fine motor skills to fold the thin paper, and also because it made a cute little pocket heart! The individuals could give the heart as a Valentine, or put candy or a love note in the pocket before giving it to someone they love! This program especially warmed my heart because there was a tea party the individuals could have gone to, but eight of them wanted to come to the library instead!